Law & Social Inquiry (LSI) is a multidisciplinary quarterly publication of original research articles and review essays that analyze law, legal institutions, and the legal profession from a sociolegal perspective. LSI contributors examine law-and-society issues across multiple disciplines, including anthropology, criminology, economics, history, philosophy, political science, sociology and social psychology. The journal’s combination of empirical and theoretical scholarship and critical appraisal of the latest sociolegal scholarship makes LSI an indispensable source for legal scholars and practitioners. 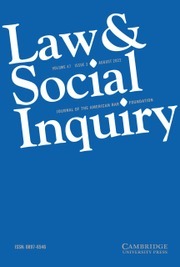 Law & Social Inquiry is published on behalf of the American Bar Foundation. The AMERICAN BAR FOUNDATION, ABF and related seal trademarks as used by the American Bar Foundation are owned by the American Bar Association and used under license.